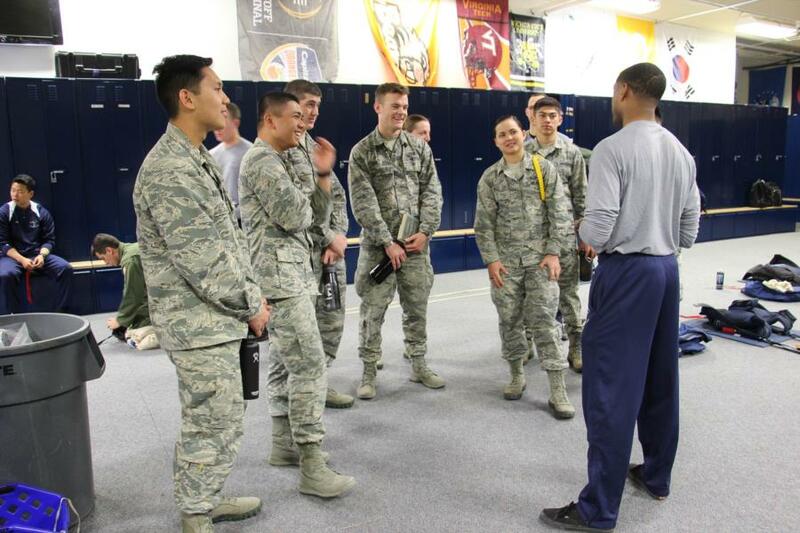 Eight Preppies were given the opportunity to go to the 98th Flying Training Squadron at the Airfield on Saturday. They were scheduled to do Tandem Jumps but because of the wind - that part of their visit this time was cancelled. 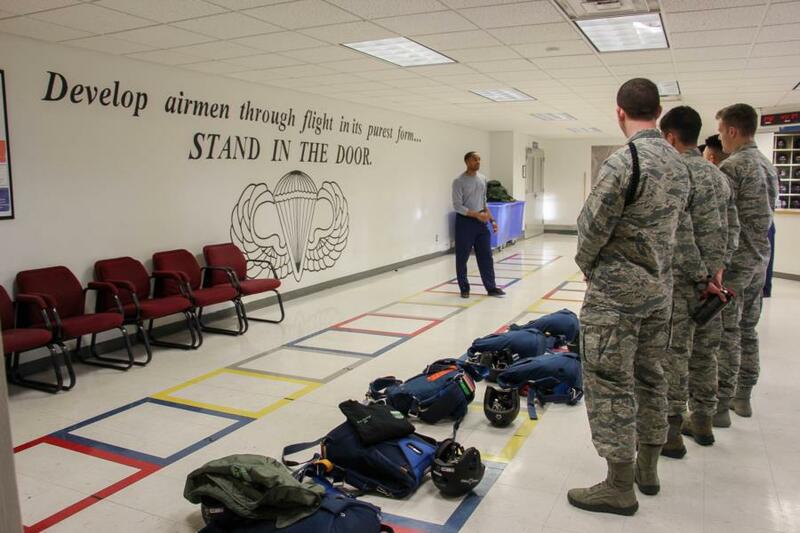 They did however get a great tour of the 98th Flying Training Squadron Facilities. They were given the tour by C17 Robert Farley who is currently on the Wings of Blue Team. At the beginning of their tour they got to watch a video about the Wings of Blue. It featured some of the experiences they are able to have while on the team. 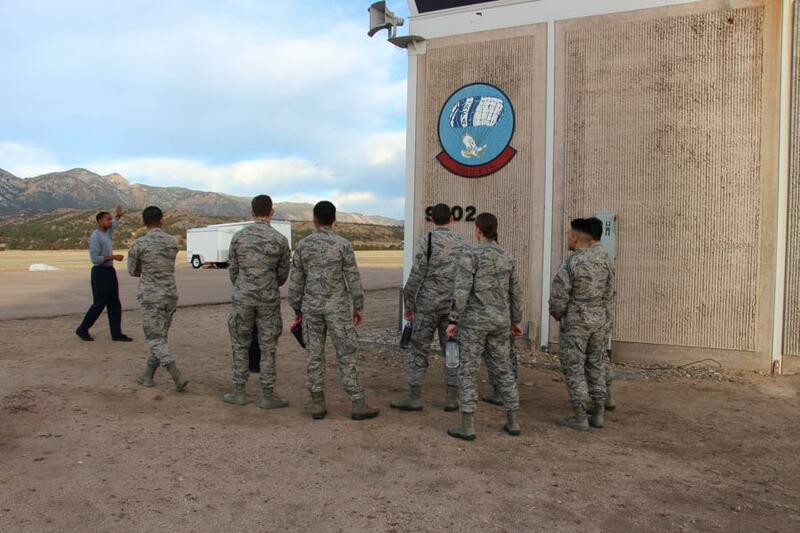 Next they walked through the main building for the 98th Flying Training Squadron. There are two separate main rooms where the Cadets and Staff pack their parachutes; one room is used by the Wings of Green. 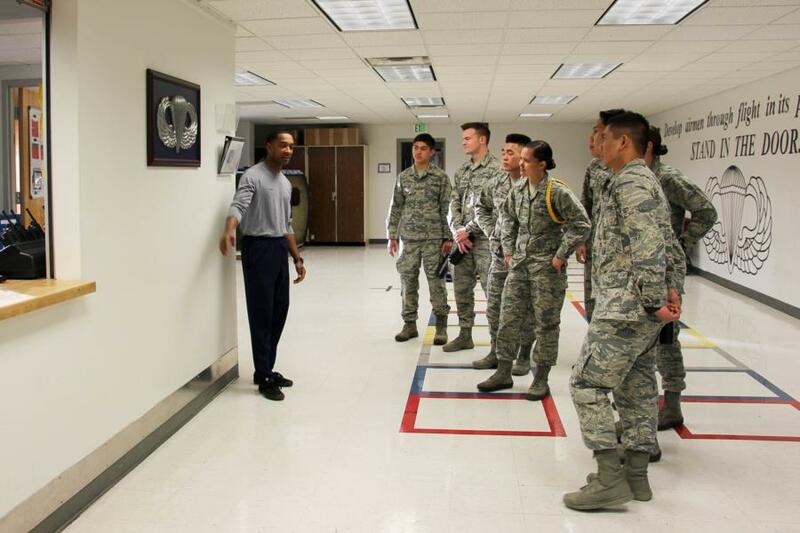 The second room (which they are standing in, in the picture below) is the room that the Wings of Blue pack their parachutes. Each year at the beginning of the Fall Semester more than 200 cadets will apply to be chosen for the Wings of Green, but only 25 to 27 Cadets will make the team. The Wings of Green consists of Cadets in their sophomore year. When those Cadets become juniors they move onto the Wings of Blue and will stay on that Team until they graduate from the Academy. It's not just skill that gets them on the team, but overall ethics, personality as well how they are doing academically. Everything is accounted for. The next location is where Cadets will line up and put on their parachutes before getting onto the plane. There are four colors, one for each class color. When these Preppies go into BCT next summer they will be Silver Depending on the color square they are standing in, will depend on the color parachute they have as well as their number in line. The person standing closer to the exit door is the first on the plane while it is on the ground and the last one out of the plane to make their jump. During the summer sessions between their freshmen and sophomore year, Cadets get the chance to jump on their own without being Tandem. 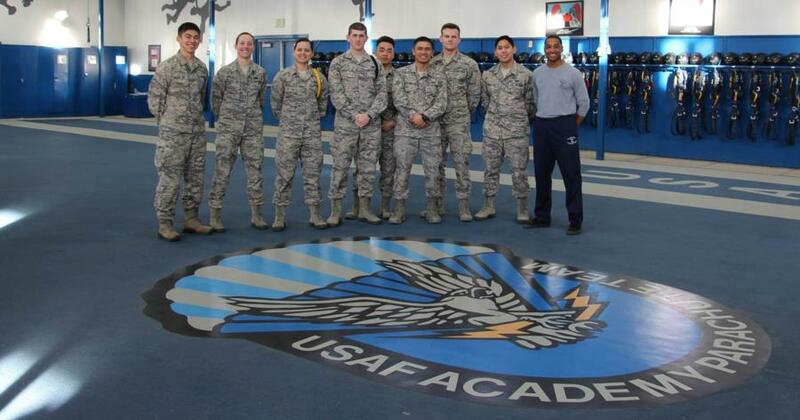 The Air Force Academy offers the only jump program in the world authorized to allow students to perform unassisted free fall delays on their first jump without any prior jump experience. Each Cadet who goes through the program must complete five free fall jumps and earn their parachutist badge and rating. When geared up for their jump they are not only wearing the parachute, they are also equipped with a radio so all landings can be assisted from the ground. The basic program trains 1,200 students per year. In the picture below, if you look to the left on the Wall. Those Wings are Iconic for all Cadets going through the Jump Program. As they walk by in their group to head out to the aircraft each Cadet places their hand on the Wings. Thousands of Cadets have passed by and placed their hand on the Jump Wings. For tradition and for luck. If you know a Cadet or are one that has gone through the Jump Program, whether it was over the summer sessions or during the academic year then you'll know that spot. 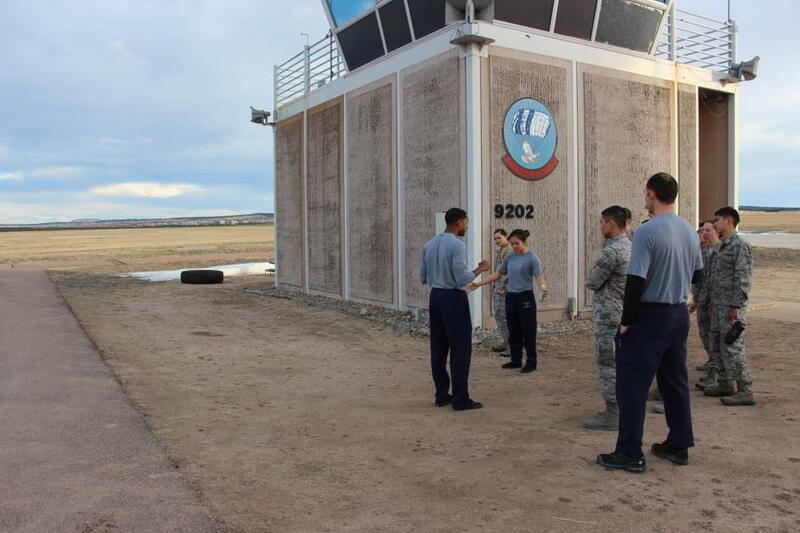 After each group of Cadets has completed their 5 jumps, most of them will gather and get a picture in front of the 98th Flying Training Squadron Patch on this building. This building is the 98th Flying Training Squadron Jump Control Tower. This is where Cadets on the Wings of Blue are standing watch with cameras and videotaping the jumps for the Cadets during their free fall. 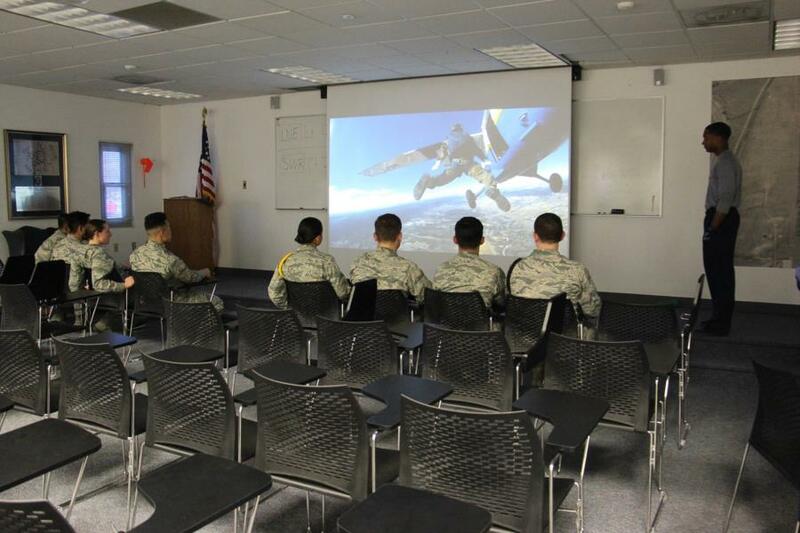 After they have completed each of their jumps their group will gather in a room to watch the recording of the moment they each exited the aircraft until they deployed their shute. Cadets enrolled in the course undergo more than 30 hours of ground training prior to their first free fall jump. The intense ground training introduces and develops procedures and techniques for high altitude free fall, and for operating a steerable parachute system. The course focuses on safety and emergency procedures to aid the students' ability to overcome their fears and perform under the extremely stressful and potentially life-threatening situations they may encounter. Prior to each of the five jumps, Cadets in the AM-490 class receive two gear inspections to ensure their parachutes are fitted and working properly. Once they are airborne, the jumpmaster determines the exit/opening point, which varies with the day's wind patterns, Cadet's then receive their third and final gear inspection as the plane turns inbound for the jump run. At 4,500 feet above ground level (AGL), winds rush into the fuselage as the jumpmaster opens the door - then the jumpmaster instructs the first jumper to: "STAND IN THE DOOR"
Below is a clip taken of the Preppies while they were in the Ground Training Facility (GTF) The Preppies were given a taste of what it feels like in the aircraft and how they would exit to begin their free fall. 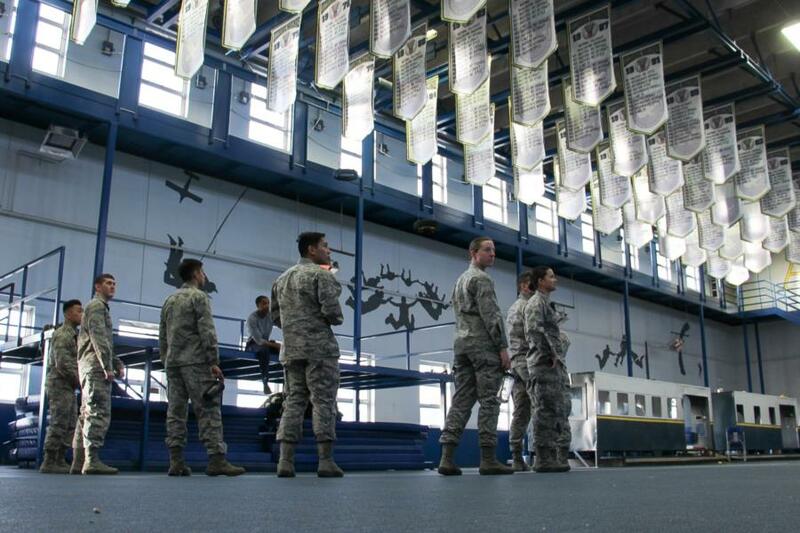 Above them on the ceiling hangs the Wings of Blue banners over the last 20+ years from competitions and records made from cadets while they attended the Academy. The Preppies were given a great tour of the 98th Flying Training Squadron, we are definitely looking foward to visiting it again when they are able to do their Tandem Jumps! To see the rest of the pictures from their tour go to Classes - Prep School - Prep Life. Or click the link below.